While we know our wallpapers are amazing, high quality and unique, we know that you may not. So to help you make your wallpaper choice easier, here are a couple things you need to know about Milton & King wallpapers before you make your purchase. All Milton & King wallpapers have a Class A/Group 1 Fire Rating. This means our wallpapers are highly resistant to fires and they do not spread flames quickly. As a result, our wallpaper coverings are the perfect choice for not only homes, but also commercial precincts. Here at Milton & King, all of our rolls that you purchase are considered double rolls. This means that in comparison to regular single rolls which are 15 feet long, our rolls are 30 feet long. This ensures you get better value for money with each wallpaper purchase you make through us so all you have to do is focus on the job at hand. Unlike other wallpapers, ours can be easily cleaned. Protected with two coats of a specially formulated glaze, this makes the non-woven base and paper top layer extremely durable and easily cleaned with a simple damp cloth and soapy water. You are simply able to use the damp cloth to wipe then immediately following, use a dry cloth to wipe any excess solution off the paper. We know dealing with shipping is annoying and frustrating, so we’ve taken away the hassle and offer you free shipping on all orders, worldwide! Not only that but it’s super quick too, so you can be assured you wallpaper will arrive in no time, so you can start renovating! Everyone has different tastes and styling preferences when it comes to their home or interior project, which is why we have a huge range of designs on offer at all times. Additionally, many of our designs offer various colorways, some even up to five different color alternatives, to ensure you get the exact wallpaper covering you need to trasnform a space from drab to fab. You won’t find any of our patterns in another store as they are completely unique to us. Here at Milton & King, we have a small family of developers and designers who create stunning wallpaper patterns and designs for you, and we even print them in-house too. Our designs are printed on 150gsm non-woven paper and are double-coated with our specially formulated glaze to ensure durability and practicability. This ensures your wallpaper looks better for longer, with less damage, fading, and dirt build-up. We also print our designs on a “made to order” basis to ensure all your rolls for your room are within the same batch to avoid any discrepancies in color that occur during printing, ensuring your walls look perfect and polished after installing our wallpaper. We believe that with any great product you need equally great users. If you are a trade user such as an architect and interior design professional, we offer a fantastic trade program that is quick, collaborative and successful for both yourself and your clients. 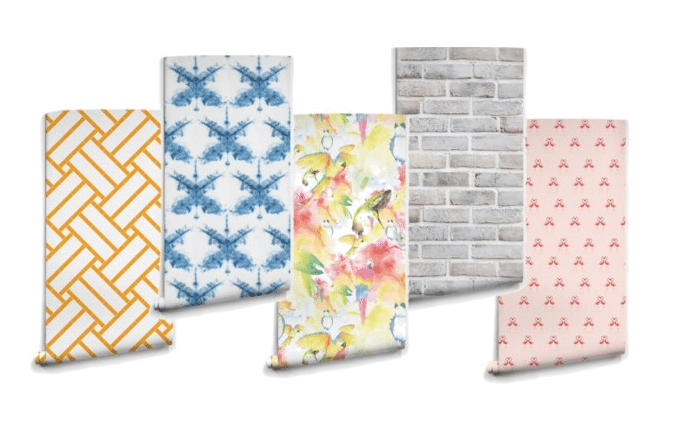 With our trade program, you can request free samples that will be sent out via express courier and receive discounts on our beautiful wallpapers for you to use in your work. If you want to find out more information, you can read more here. We’re not the only people who love our designs… so do many of your favorite bloggers and inteiror designers! Lindsay from The White Buffalo Styling Co (read more on her master bedroom transformation using our ‘Wildflower‘ pattern here), Naomi from Design Manifest (read more on her living room spruce up using the ‘Nixon‘ wallpaper here), and Yvette from The Stylist Splash (read about her master bedroom makeover using our ‘Marble‘ design here) are just a few of the bloggers that love our wallpapers and have used them in their own homes. Not only do we think our designs are creative and unique, we believe they can help inspire your styling. Additionally, we also have a fantastic Pinterest page where we share gorgeous snaps and renovation ideas for you to gain inspiration from! If you have Pinterest, jump on over the join the pinning party… we’d love to pin with you!